Please note that the content of this book primarily consists of articles available from Wikipedia or other free sources online. 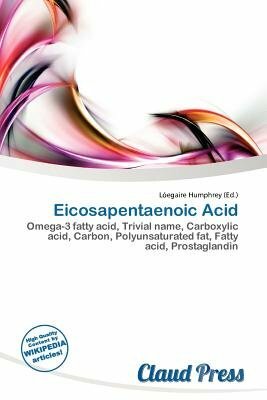 Eicosapentaenoic acid (EPA or also icosapentaenoic acid) is an omega-3 fatty acid. In physiological literature, it is given the name 20:5(n-3). It also has the trivial name timnodonic acid. In chemical structure, EPA is a carboxylic acid with a 20-carbon chain and five cis double bonds; the first double bond is located at the third carbon from the omega end. EPA is a polyunsaturated fatty acid (PUFA) that acts as a precursor for prostaglandin-3 (which inhibits platelet aggregation), thromboxane-3, and leukotriene-5 groups (all eicosanoids).